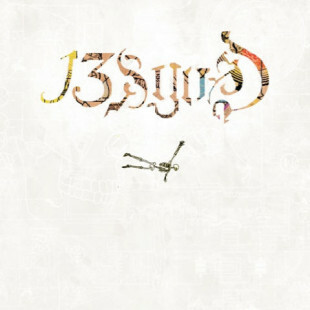 After a six year wait, following the now well-worn debut album, 13 & God’s “much anticipated” follow-up lands with a decided ho-hum in the music press, so far. Word is it’s a “real band” now, combining the talents of Oakland’s Themselves and Germany’s The Notwist into an actual everyday working unit, as it were. The story behind the original connection is that the two bands found themselves stranded on the road in Canada in the Winter of ’04, and they discovered a mutual admiration and a unity of spirit, and serendipitously came together to form a new intercontinental musical “brotherhood,” their electro-organic sound falling somewhere between two musical continents. There’s certainly some differences in the overall sound from the first album, but the elephant is still in the room: what, exactly, do they plan to do with all the resources they’ve assembled? Let’s put this disclaimer out there right away: There’s a Scissor Sisters dancey-rock aspect to some passages here that is clearly rooted in 70s white rock-soul tropes, and it would be great if they would blow the lid off that paradigm and do something completely “Average-White-Band-on-bad-designer-drugs” circa 1973 in 2011, but, for whatever reason, they don’t commit to that. They largely alternate between two basic poles. A case in point is “It’s Own Sun,” which starts off as a promising acoustic appetizer, but after about a minute they introduce some skittery beats and it becomes something entirely different and kind of falls apart. “Armored Scarves,” on the other hand, is a song that haunts your head upon first listen as it flashes back to the early 00s and smokes a cigarette with Badly Drawn Boy and The Beta Band; transfiguring itself into a higher piece of art and declaring itself one of the best songs of the year by anyone anywhere up to this point. Why not more of this stuff? Please! Instead we get whimsical space-pop like “Old Age,” or we get “Janu Are,” with its trademark Anticon post-mod rhyming platform. I’m not ragging on those songs, they’re certainly better than eating an egg salad sammich that’s been hiding in the truck for a week. Either way, they never quite commit to anything for any extended period, and that’s the only thing holding them back and preventing this joint venture from being the off-da-hook, brain-bending, body rocking engine it rightfully should be.